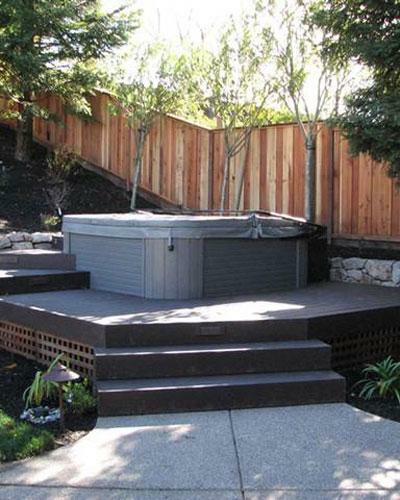 Hot Tubs continue to increase in popularity, but increasingly we are asked throughout many Yorkshire towns to create bespoke wooden surrounds to blend in to gardens. Our clients needed some help overcoming the awkward levels presented in their garden. They briefed us to develop an area to accommodate a hot tub including a decking surround. Minimum maintenance was key. After a small amount of excavation, we were able to implement a low maintenance composite decking scheme around the hot tub with bespoke landscaping and stone work coupled with a fencing solution that created a seamless design.